In between storms, I returned to Maine’s Morse Mountain. Winter skies reveal broad vistas. Spot the snow-clad peak of Mt. Washington in New Hampshire 100 miles away, away, away…. The sea swallowed snow before winter froze the tide. The icy path is treacherous. Surreal. The sun dares not climb too high in the sky. Seawall Beach is wiped bare. Only the islands can stand the frigid sea. 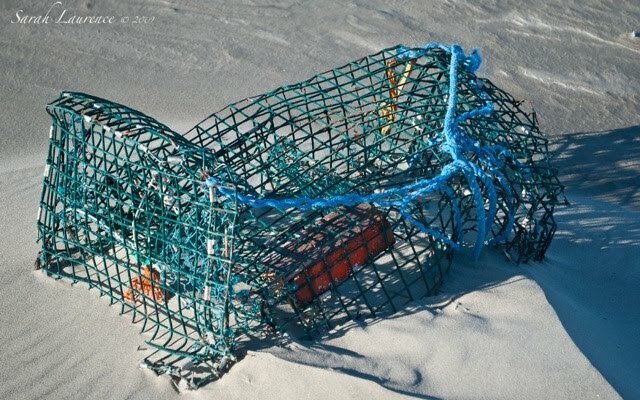 Lobster season is over, except far offshore. Blog Watch: Author Justine Larbalestier gave excellent advice on "How to Conduct an Interview" on a blog. A Cuban in London reviewed a witty book of poetry, More About the Song by blogger Rachel Fox. Congratulations to debut author Marie Mutsuki Mockett on the birth of her first child! Troutbirder has a new grandchild. Elizabeth Wix also has a special new addition to her extended family. Elenka's husband is back home and doing well after heart surgery. This already looks to be a most happy new year. I never get tired of these pics. Beautiful, striking country. I am obsessed with your ice pics, Sarah. And how nice to see Mt. Washington again. I was there about seven years ago. We went up to the top in July and it was SO windy and cold! Lovely photos, Sarah. Why doesn't MY camera do this? Oh, wait ... might it have something to do with the skill of the photographer? Seriously, though: great work. I love your pictures! When I was looking at the picture of Mt. Washington, I thought I was looking at clouds--funny how we see things differently. I hope your Mom will have a very special day. Your blog does Maine such a good service by showing Maine's beauty! Happy Birthday to your Mom! Such lovely, icy images! Maine looks so beautiful. We're looking to get a summer rental in Maine. Any suggestions as to what areas are best? I've never been there. David, great because I never tire of taking them! I’m tempted to go back and get snow shots too. JAPRA, ice obsesses me too. I’ve never seen such odd circles and swirls but perhaps I never stopped before to look carefully. My son likes crunching the ice beneath his boots. I hiked Mt. Washington as a teenager over 2 hot summer days. It was refreshingly cool at the top. It’s a totally different climate up there. My son was upset not to find snow at Morse since we had it inland – “there’s the snow,” he said pointing at Mt. Washington. Maria, the Nikon DSLR 80 does take amazing shots, a polarizer filter cuts glare and I can correct for sun spots in Lightroom on my computer. The other crucial ingredient is a patient family willing to wait while I slowly frame my shots. For every shot on this blog, there are many discarded. I’m looking for company skiing Morse tomorrow if you’re game. Tracy, I first thought they were clouds too. I zoomed in and cropped to get the shot. I crave a stronger telephoto lens. My mom has a special dinner date with my dad tonight. 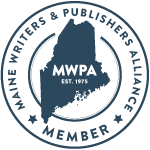 Tina and Alyson, I’ve created a new label “Maine places” to find special spots to visit. My mom will be pleased to hear more happy birthday wishes, thanks. Alyson, here are some MAINE FAMILY VACATION ideas. 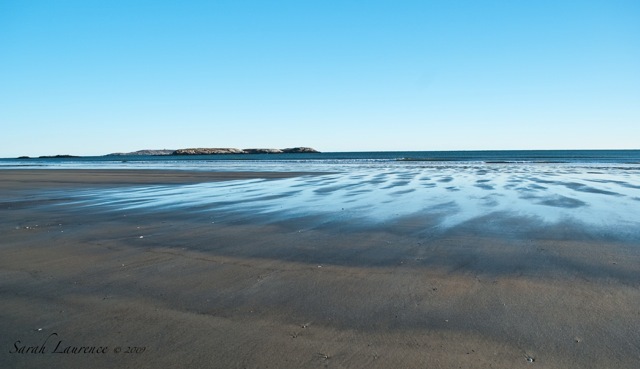 A nice beach spot in my area would be Phippsburg by Popham Beach – the kids would enjoy the waves and warmer tidal pools. Georgetown is gorgeous too but more buggy if you don’t mind. 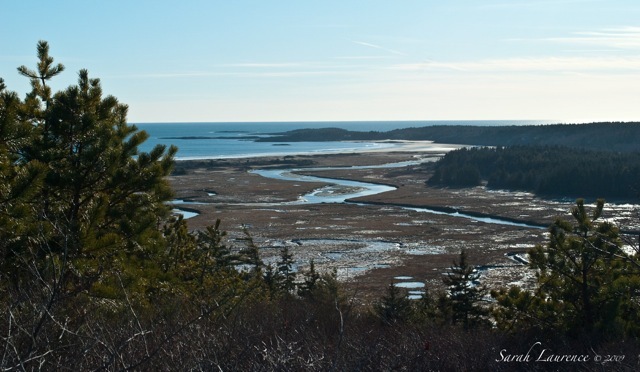 Bailey Island in Harpswell is close to me and has cottages and a beach - you can drive there. A more remote and wild island by ferry with a fairy forest is Monhegan Island - a delight. Acadia National Park is stunning but a bit crowded, still worth a visit. We’ve stayed at cabins on Moosehead Lake inland. The Birches Resort is ideal for families since you can cook in your cabin or dine at their restaurant. You get your own lakeside log cabin, but the plumbing is a bit primitive. They have a little beach with a raft and canoes to hire and Moose watches. It’s the biggest lake in Maine. That’s my kids’ favorite spot. I like to paint there too. Lake Sebago is also popular and a bit closer to me and to Boston. The White Mountains around Bethel is great for hiking but challenging. Be sure to let me know when you are coming so we can meet up if I’m around. How fun! Skeeter, thank you! Stella and I just came back in from skiing. The ice has been covered by a foot and a half of snow. It is gorgeous and not even too cold. It was still nice to see greenery on your blog. Troutbirder, perfect words, thank you! Thanks for all the suggestions, Sarah! We'll definitely have to meet up if you're around. The patterns in ice are beautiful. Would be interesting to see more of these patterns. Nature creates rivetting patterns. With the light apparently sharp, you might want to consider using a polarising filter on your lens to control shades, and get deeper, richer shades, softening glares. Marumi polarising filers do a good job in cutting out flares from light bouncing off sharply on white surfaces such as snow and metal. Also a mandatory UV filter on your lens should help with softening the sky up in sharp light. Anil, would you believe I was already using a polarizing filter? I always use one on the beach or on bright winter days. Otherwise I use a UV filter. For the best view I had to shoot into the sun. A hood on my lens would help as would longer days. The colors are a bit washed out naturally at this time of year too. This was an especially stunning group of photos. The cold almost seeped out of the computer at me. I thought how dangerous it would be to fall into one of those frozen creeks. But the photos that I loved most were the abstracty ice ones. Just as, or more, fascinating than abstract most paintings. How kind of you to mention little Henry James who after a slow start is plumping up nicely. Oh my - what amazing shots!! All great but I love the one of the ice path. Happy birthday to your mother! Ewix, I love looking for abstraction, as do you. I don’t hike alone at Morse during the winter. My son was with me on that hike. Tomorrow I’m skiing there with 2 or 3 other women – we just got a foot and a half of fresh snow. I’m a bit worried about the steep incline on cross-country skis, especially with the creak at the base. You know where to find me, if we don’t return. I’m glad to hear the lad is doing well. I would have deleted the England photo comment, but she’s just a teenager. No need to apologize for bloopers in comments. I do that too. Bonnie, the ice path was my favorite too. Thank you! Many, many thanks for those fantastic pictures. You would have thought that nursing a cold, as I am now, would have put me off photos of ice and snow. But no, they are magnificent and yes, that ice patch IS surreal. Oh, nature, nature, you're so beautiful! By the way, thanks for your comments last week about the clip specs. I finally realised that the problem is with youtube. They have four standards sizes and I usually go for the smallest one or the one after. But occasionally they have clips in HD and HQ and their specs change. And that's why some of my videos don't fit on my blog. It's the same problem with other bloggers. Ta, anyway. These photographs have such incredible texture. 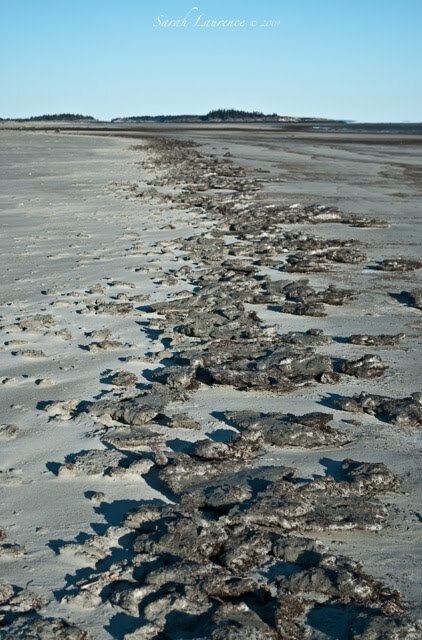 That icy path, the long dribble of forts, the sculpted sand: amazing! I often think that I prefer pictures with people in them, but when I look at these photographs I change my mind. Is it a rarity to have such a sharp, clear blue sky? It really sets off the earthy colours. This is a fitting tribute to your mother. Very best wishes to her. Thanks for allowing me to enjoy ice and snow without having to get cold, something to which this Floridian is allergic. Great photos. Very nice photos. I know you are aware of how blessed you are to live near such beauty. I'm having trouble trying to wrap my brain around the fact you can see 100 miles into New Hampshire. Sarah: You totally blew me away with these photos! Thank you for the tour--gorgeous. I especially love the swirly ice shot! I got lost in those images. Deeply stirring. Can't help but love your greedy sea, swallowing up the snow. Daring the sun to do what it does best. Seeing Mt. Washington stirred something below my heart and above my stomach. Reminded me of my Kilimanjaro, her two peaks Kibo and Mawenzi, bare of snow now after all the years of climate change. And maybe that's why they coined the term, No Man Is An Island, because "only the islands can stand the frigid sea." 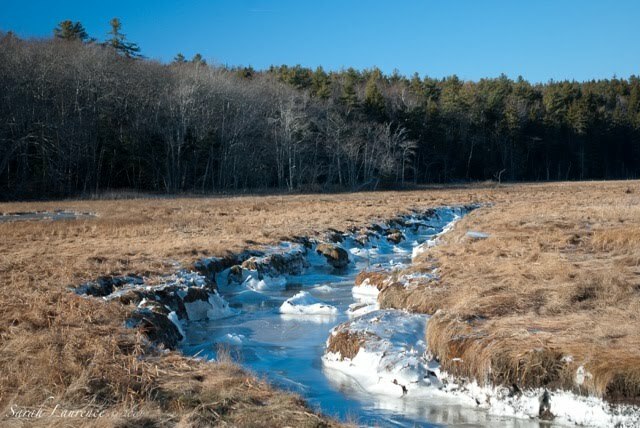 Beautiful photos, Sarah--you make even the cold look inviting! I appreciate your directing readers to other "blogs of note." I've found some very interesting posts through these links. Hope the sun is shining for you! 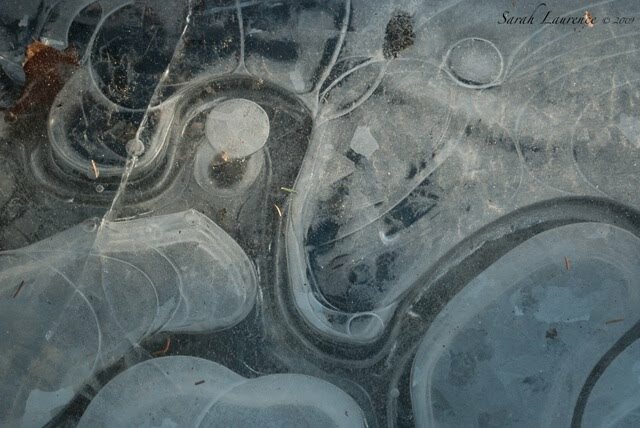 I LOVE photo #4--the swirls in the ice. Just amazing what is out there waiting to be seen. Stunning shots! Love your surreal one(No.4)and abstract one(last) especially. I like "Seawall Beach is wiped bare" very much too! Oh You use Marumi filters. Do you also use Kenko filters? All, sorry to be slow to respond. I’m not lost in a snowdrift. I was planning to ski Morse Mt. with friends today, but we had to switch to a closer venue. I’m still dreaming of doing it someday. It was at least a productive writing day, and I had a nice short ski with friends. ACIL, I’m sorry to hear that you are sick. I’m glad to hear that my photos offered some comfort. I almost always have to resize a YouTube clip after posting, which is why I rarely bother. You can edit the size under edit html in your posting screen. Thanks for the tip on checking YouTube for sizes. Bee, thank you! You might have guessed that I prefer photos without people although sometimes they are good for scale. The landscape here is so stunning on its own. I also enjoy abstraction and texture as you noted. 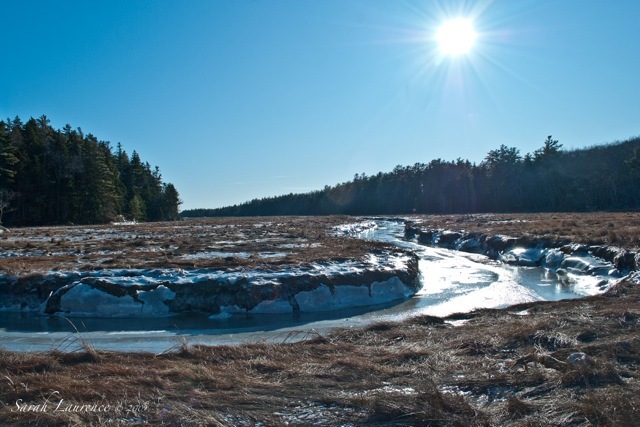 A sharp clear blue sky is a signature of this part of Maine in winter, unless it’s stormy. My mother had a fine birthday, thank you. Judith, welcome to my blog and thank you! I was moved by your haiku to Haiti. Les, it’s amazing to look 100 miles and see mostly trees. I am lucky indeed. Kathleen, thank you! I loved the photos on your blog too. Nice to reconnect with you. Mama Shujaa, the first time I saw Mt. Washington from Morse it reminded me of seeing Mt. Kilimanjaro too. When I flew to Tanzania 2 years ago it still had snow but less than I remembered seeing from Kenya back in the 80s. It is too sad to think of Kilimanjaro being a victim of climate change. Mt. Washington gets a fresh supply of snow every winter. Asante sana! Rose, that my aim in posting my blog watch. I’ve discovered some wonderful blogs through other bloggers too. We had clear blue sunny skies today - I had a lovely ski in the sun at midday. I’m glad to hear the sun shined for you too. Cynthia, I can’t take all the credit – my son, the ice stomper, pointed out the cool ice pools to me and patiently waited while I snapped away. Sapphire, it sounds like #4 is the winner. My favorite too. 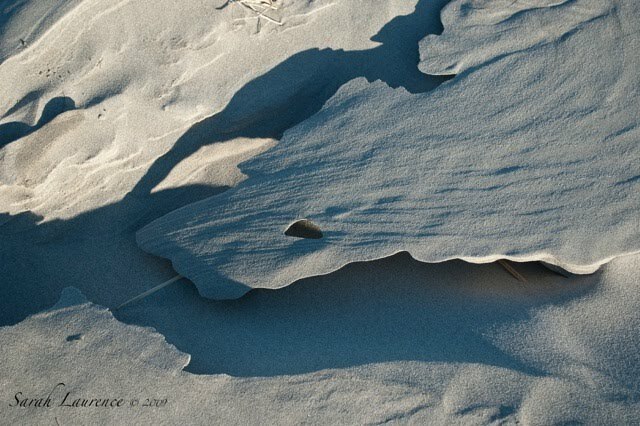 That wiped bare shot gives the best feel of the beach in winter. I use a Kalimar polarizer from Korea that I can adjust and a Royal UV filter from Japan. Both are from the 1980s for my old Nikon FE2 SLR camera. It was Anil P who uses and recommends Marumi filters. I’ll have to check them out. Top of my list would be more lenses for my DSLR, but I’ll need to sell a few more photos first. Sarah, your pictures are the next bet thing to being there! Barrie, I wish you lived closer to me. It's nice, though, to warm up at your blog. Sarah, your photos are fabulous! What a great portrait of that area. These photographs remind me of Tolkien's Middle Earth! Or maybe just New Zealand. Beautiful! Shauna, thanks! It’s nice to see you back online. Pamela, I loved the movies of The Lord of The Rings too. In Maine we get gorgeous landscape without the orcs! That's excellent choice. Like you rightly said, beaches and ice need polarisers. Yes, a lens hood should help. Back here in India, late afternoon is the best time to shoot as is early morning. Most other times the sunlight here is very harsh, unlike what one might expect in the USA or Europe. Anil, the light is worse at midday in Maine too, but the air is less frigid. Short days and low temperatures make winter photography a challenge in the north, but the clarity of the air is a plus. I enjoy the warm images on your blog. Emma, welcome to my blog and thank you! It’s nice to connect with another writer/reader. I tried to leave a comment in your latest post but the comments box is not available. Writers don't work normal hours. Just like any artist, you're regularly observing, absorbing, processing and interpreting. This definitely encapsulates that process:' I collect laughter and sorrow'. Spot on. Many thanks for those beautiful pictures and this so well-crafted column.